Two of the recipes I made for Browniefest came from Cook’s Illustrated : the first, by Andrea Geary, was originally published in the magazine in 2010, and the second (no author attribution) was published some six years earlier. I found both by searching online (I have a subscription to cooksillustrated.com) but the 2010 recipe was recent enough that I actually had the original magazine. I believe at least one of these recipes has been featured on America’s Test Kitchen TV as well. The two recipes don’t have a whole lot in common: “Chewy Brownies”, the 2010 recipe, is specifically all about the texture of the cake (or bar or whatever you want to call it); it has a lot of chocolate, and no topping, but they went to great lengths to replicate the ratio of saturated to unsaturated fats from boxed brownie mixes, whereas “Classic Brownies with Coconut-Pecan Topping” from 2004 is more about the combination of chocolate, coconut, and pecan flavors. Interestingly, the evaluators rated the older recipe significantly higher on all attributes, even chewiness. 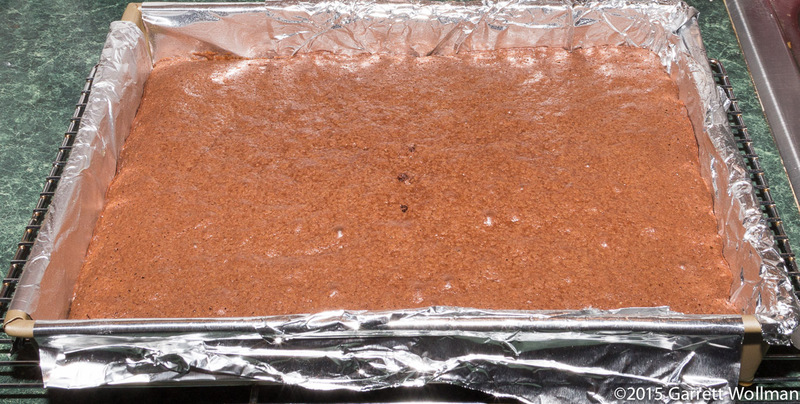 “Chewy Brownies” calls for a great deal of chocolate, but a substantial part of it was in the form of hand-chopped bittersweet chocolate chunks, which were not melted — giving rise to numerous complaints about the finished texture. 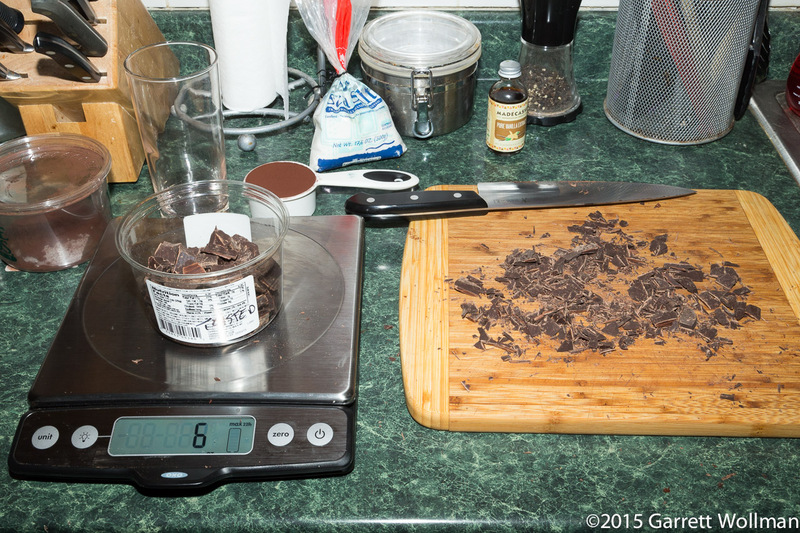 It’s possible that if these brownies had not been frozen for storage, the chocolate chunks would have remained softer and been less objectionable for those tasters. In any event, the recipe headnote calls explicitly for Callebaut L-60-40NV, which luckily I can still get at my local Whole Foods, so the first part of the process was chopping the chocolate, and then filtering out the “waste” (small pieces of chocolate which actually would melt if used) to get the specified 6 oz of chunks. 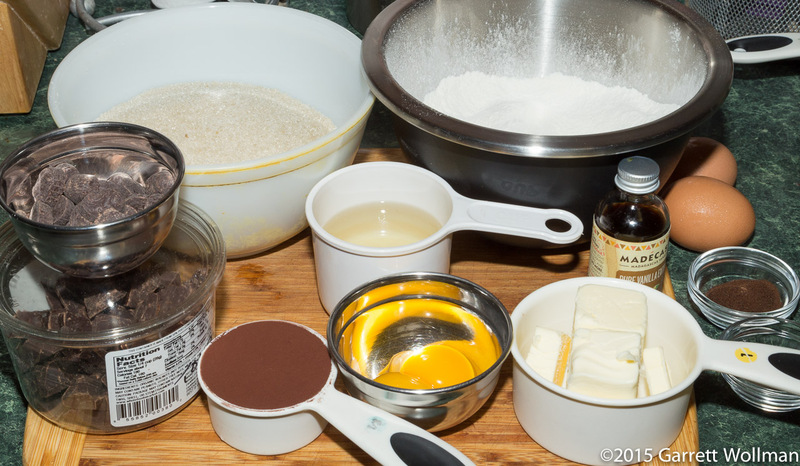 The rest of the “Chewy Brownies” mise includes two egg yolks (it was one of two recipes to call for egg yolks in addition to whole eggs), Dutch-process cocoa, unsweetened chocolate (I used TCHO for both), butter, sugar, salt, and flour. Unlike many of the recipes, which have a bare half-cup of flour, this recipe calls for nearly two cups (8.8 oz) of flour, and it is also the only recipe to use vegetable oil, in addition to butter, to provide a fat balance closer to that of boxed brownie mixes (which use a combination of oil and powdered shortening). Espresso powder is used as a flavor enhancer. 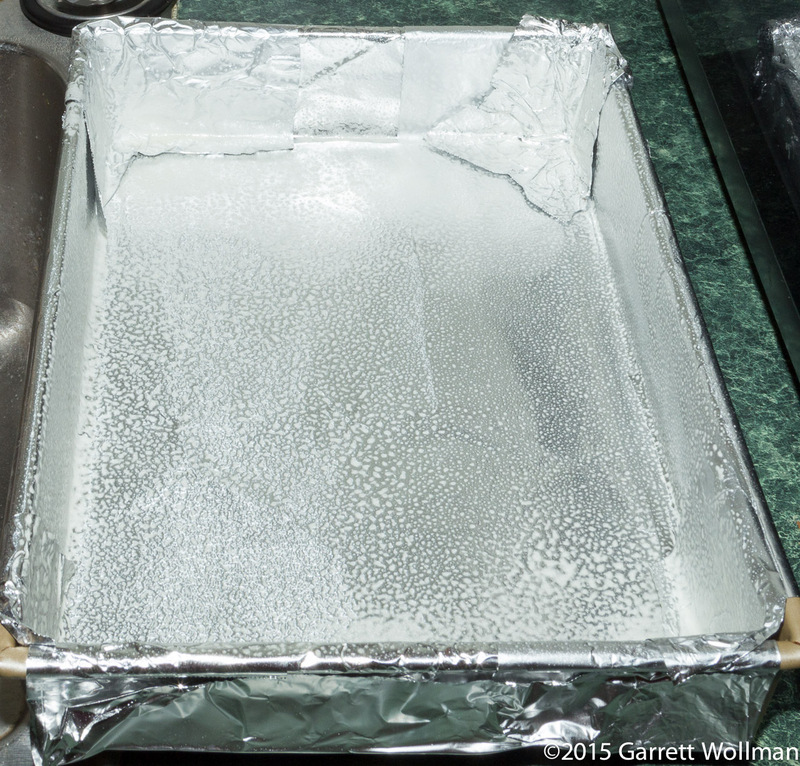 Both Cook’s Illustrated recipes contain detailed instructions for pan preparation, including making a foil sling, but unfortunately don’t account for the fact that a roll of foil is 12 inches wide but a 13×9 baking pan is 13 inches wide. I ended up adding some little scraps of foil around the corners to keep things from sticking to the pan — although it’s a good non-stick pan and shouldn’t need it, but I’m a bit paranoid after previous brownie-baking experiences where I didn’t take adequate care of pan prep. The procedure is my “Procedure #3” from my “Procedures and Ingredients” post (part 2 in this series). The fully baked “Chewy Brownies” look nice and dark here cooling on the rack. The older recipe, “Classic Brownies”, is quite a bit different, although it makes the same number of servings and uses the same size pan. This recipe uses four whole eggs, rather than two whole and two yolks, and only one form of chocolate, plain unsweetened chocolate (I again used TCHO 99% dark chocolate critters). This recipe is the only one of the fifteen to use cake flour, and I used nearly the last of my King Arthur “Queen Guinevere” bleached cake flour — now discontinued — to make this recipe. It’s also leavened, and judging by the proportions, I suspect you could easily substitute self-rising flour for the cake flour, salt, and baking powder. Finally, “Classic Brownies” use more butter (no oil!) and more sugar than “Chewy Brownies”, and no bitterness-enhancing espresso powder. The procedure is what I identified as “procedure #1” in part 2. If you scroll up you can see very clearly that these brownies are much lighter and redder in color than the “Chewy Brownies”; I attribute that to the lack of both Dutched cocoa and espresso powder in the “Classic Brownies” recipe. These weren’t just “Classic Brownies”, but “Classic Brownies with Coconut-Pecan Topping” — also known as “German Chocolate” topping, after Mr. German’s chocolate cake, which has a similar gooey coconut curd used as a filling. The topping is made with toasted pecans and coconut, of course, bound together with a curd made from sugar, butter, cream, and egg yolks. 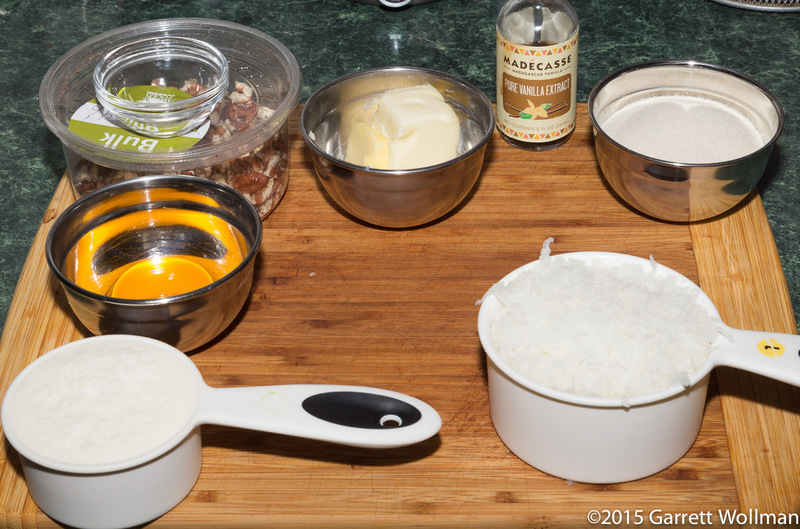 The topping is spread on the brownies before portioning, and then the whole pan is refrigerated overnight to set. As with most of these recipes, I had a serving before packing these brownies up for transportation to the office. In this case, I left them in the 13×9 pan — this was the next-to-last recipe I baked — in the refrigerator until the appointed day and time. The “Chewy Brownies” were not rated highly by the tasters, with an overall rating of 2.9 (n=6), just below average on my scale but in the bottom half of all responses; they were rated 3.2 on “chocolate flavor” and an above-average 3.8 on “chewiness”. The “Classic Brownies with Coconut-Pecan Topping”, on the other hand, came in third overall, with a score of 4.3, albeit with a very small sample size (n=2), and tied for first place (5.0) in the “topping” category (out of 10 recipes from all bakers that had toppings). This roughly matches my own impressions; I did not think the extra effort involved in making “Chewy Brownies” was rewarded by any improvement in either texture or taste, but the coconut-pecan topping seemed to be worth doing again (perhaps on a different brownie base that can stand up to it with a bit more chocolatey flavor and color). Both of these recipes count as “A Low Sodium Food” under FDA regulations. This entry was posted in Food and tagged browniefest, brownies, chocolate, coconut, pecans, recipe. Bookmark the permalink.